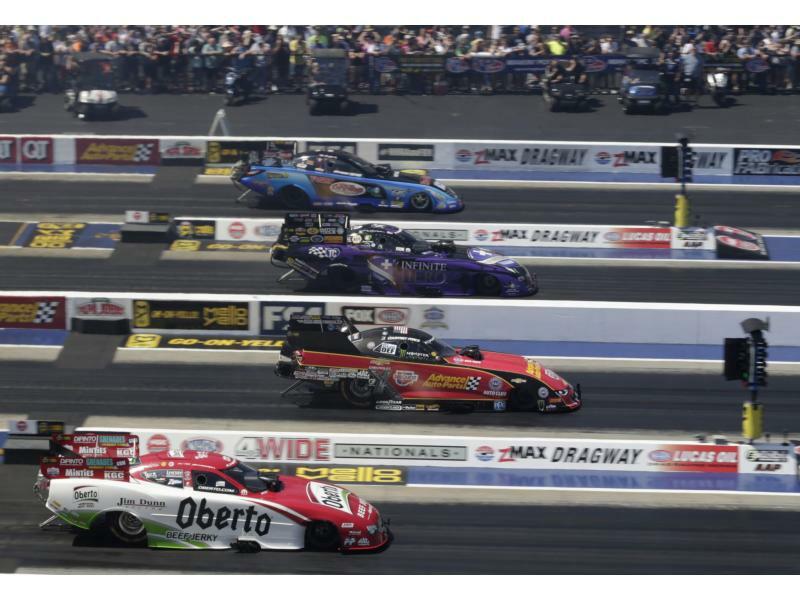 Force power has been on full display as the NGK Spark Plugs NHRA Four-Wide Nationals prepares to build to a nitro-fueled crescendo at zMAX Dragway. Under clear skies and in front of a packed crowd, Brittany and Courtney Force ruled the road on Saturday at the Bellagio of drag strips. Brittany Force's track-record elapsed time of 3.689 seconds at 318.39 mph in Friday night's Top Fuel qualifying held up Saturday, as did Courtney's 3.873-second, 332.92-mph pass in an electrifying round of Funny Car time trials. The occasion marks only the third time the sisters have shared No. 1 qualifier spots in a race weekend - and the first since 2014. 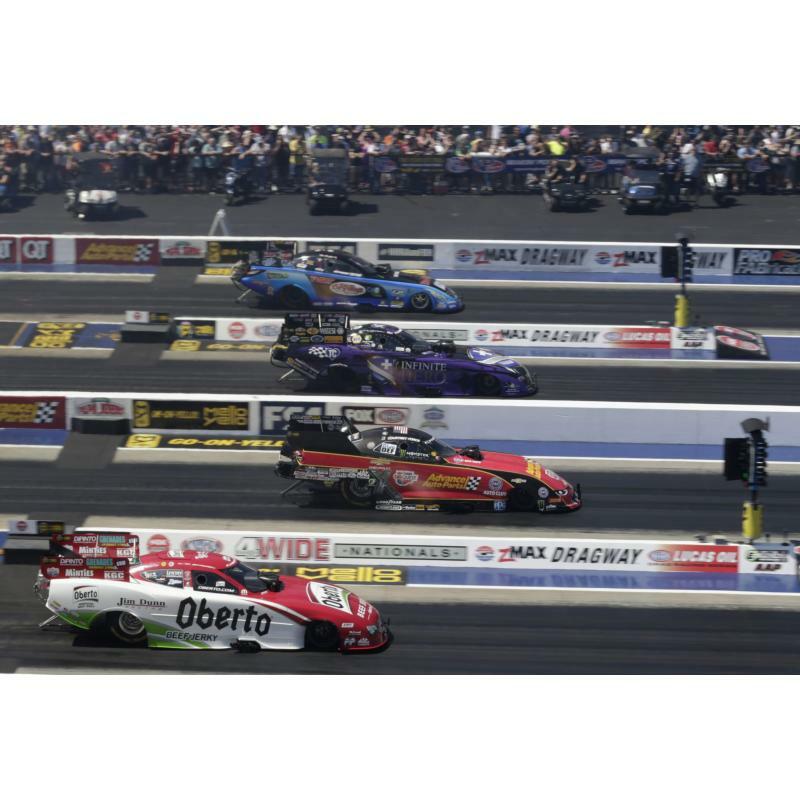 "We're feeling really good and just looking at our season overall, everything our team has pulled off is amazing," said Brittany Force, who on Sunday will chase her second NGK Spark Plugs NHRA Four-Wide Nationals win in three years. "We're on a roll. … It definitely helps that we've won this. Four-Wide is awesome. That was a special win for us (in 2016) but since we did it once, we want to do it again." Courtney Force will chase her first four-wide Wally at zMAX Dragway on Sunday. "With it being a bit cooler tomorrow, hopefully the runs tomorrow will be similar to the runs we had on Friday," Courtney Force said. "We've been No. 1 qualifier here at zMAX Dragway for Four-Wide before, but we've yet to take home a win. We really want to do it this time, especially since this is the home track for Advance Auto Parts." Drew Skillman held onto the top spot in Pro Stock competition as no one could 6.534-second, 210.37-mph run on Friday night. "Our car's run pretty good all weekend," Skillman said. "We have a little bit of work to do yet for Sunday, but the team's ready, the car's ready and we're ready to go. You race the track on Sunday. It's always a little different." LE Tonglet rocketed to the No. 1 qualifier spot in Saturday's Pro Stock Motorcycle trials, eclipsing Cory Reed's time on Friday with a 6.812-second pass at 196.99 mph. "The success is all on Team WAR," Tonglet said. "The bike's flying and I'm looking forward to going three rounds tomorrow. We just need to go out there, get green lights and win lights on the other end. I feel like I have a bike that can do that." 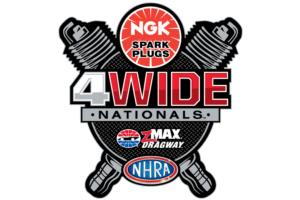 Sunday eliminations for the NGK Spark Plugs NHRA 4-Wide Nationals will begin under clear skies at 12 p.m. for Funny Car and Top Fuel. The action-packed thrill show kicks off at 10:30 a.m. with the SealMaster Track Walk followed by pre-race ceremonies getting underway at 10:45 a.m.